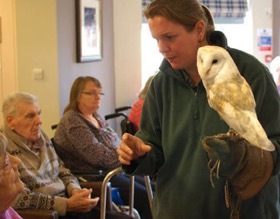 Last week Liz and Mary went to visit the lovely residents at Mills Meadow Residential Care Home in Framlingham, Suffolk with our own bird residents, Cobweb the Barn Owl and Aukland the Southern Boobook Owl, native to Australia and New Zealand. In the winter months, when it's not so busy with visitors at the Centre, we like to get out and about as much as we can, taking our story about the need for the care & conservation of Britain's wild owl species with us. Visiting residential centres like this is very rewarding - your audience is always attentive and appreciative - and often come up with a fund of their own stories about wildlife in the countryside. We had a great time speaking about what we do at the Sanctuary, as well all of the weird and wonderful things that Owls do. Everyone had a fabulous time with one resident exclaiming 'They're so cute, I could cry!' See the pictures below - please get in touch on 0345 680 7897if you would like us to visit you in the East Anglian area.